This steep, picturesque street is the main road linking the Malá Strana and Hradčany. 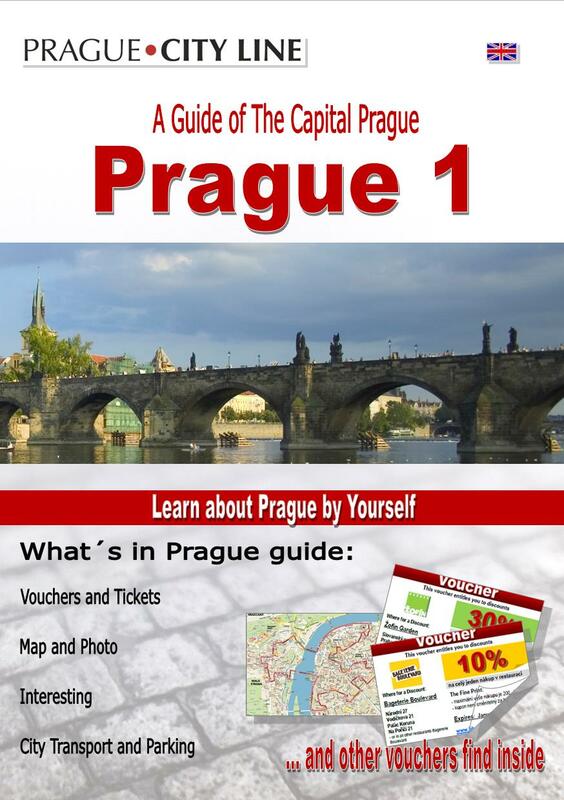 It was once part of the Royal Way, the route sovereigns would follow up to Prague Castle on the day of their coronation. The street has a distinctly baroque appearance, but many of the houses date back to medieval times. 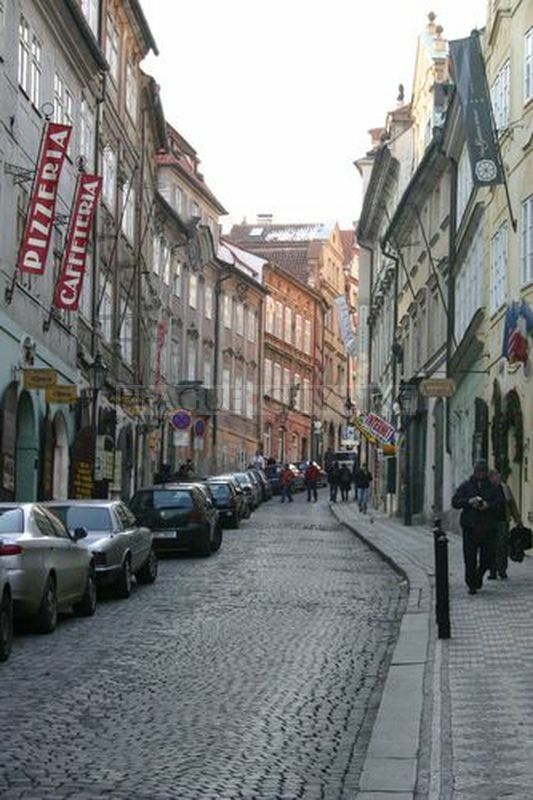 The street, originally called Strahovská at the lower end and Ostruhová at the top end, was renamed at the end of the 19th century after the writer and journalist Jan Neruda who spent part of his life in the street, and who wrote about the Malá Strana in many of his books. This street is well known for its house symbols. House symbols were an everyday sight until Austrian Empress Maria Theresa had the houses numbered. They made the houses distinguishable from those around them and often told a great deal about the status, occupation or name of the owner. Dům U TŘÍ HOUSLIČEK (No. 12) (House of the Three Little Violins). Just the name tells us that three families of Prague violin makers lived here, one after the other. The house’s façade is decorated with paintings of Greek gods. Another interesting dwelling is the Renaissance Dům U ZLATÉ ČÍŠE (No.16) (House of the Golden Chalice). As the name suggests, it was owned by a goldsmith. The Dům U ST JANA NEPOMUCKÉHO (No.18) (House of St John of Nepomuk), originally a Renaissance building, was given a baroque face in the early 18th century. The entrance is decorated with a relief of St John of Nepomuk from the beginning of the 18th century. Midway up the street, notice the green house that protrudes from the row and makes the street quite narrow. 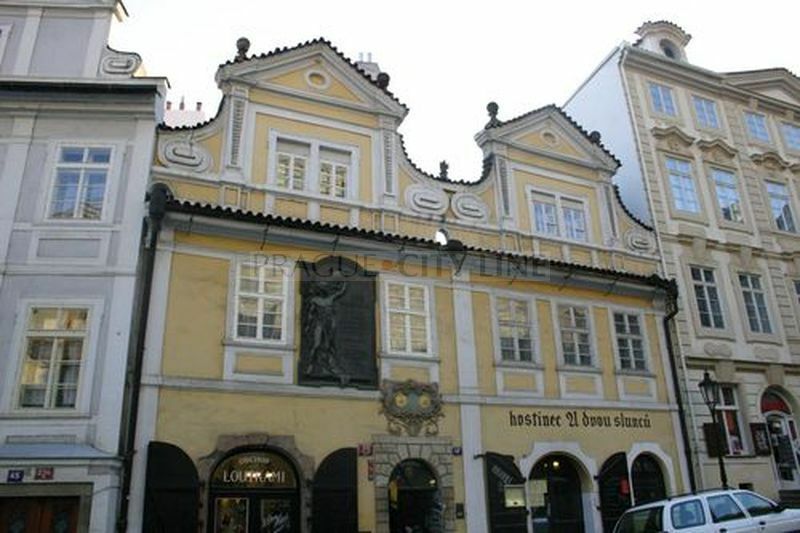 This house was originally joined onto the Strahov Gate. In the Middle Ages, the Malá Strana town walls ran through the street at this point. The house is now a tea room. Legend has it that every Friday night a firey team of horses thunders through this place, on which sits a headless skeleton waiting for his soul to be released from damnation, but nobody knows how to set him free. Approximately midway up Nerudova Street stands the a monastery and the CHURCH OF OUR LADY OF UNCEASING SUCCOUR dating from the 18th century and probably built by architects Jean B. Mathey and Jan Blažej Santini. The church is decorated with statues by Matěj Václav Jaeckl. 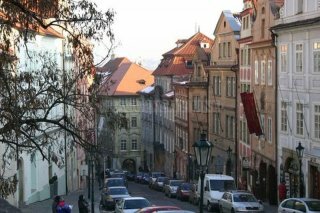 One of the last houses at the top of Nerudova Street is the DŮM U DVOU SLUNCŮ (No. 47) (House of the Two Suns), where the writer Jan Neruda lived from 1845-57. The last house at the top of the hill is called U ZLATÉ HVĚZDY (House of the Golden Star). Here the streets veers to the right and becomes KE HRADU Street. This street was driven through rock in 1638-44, in order to give better access to the castle. Immediately above Ke Hradu Street towers the Renaissance Schwarzenberg Palace on Hradčanské Square.